The Moab Folk Festival is an annual 3 day music festival in November featuring 12 live performers in the amazing red rock country of Moab, UT. It takes place during the evening at historic Star Hall and at the Grand County High School Auditorium. 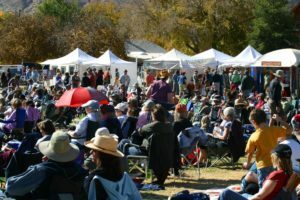 The daytime performances take place at the Moab Ballfield and include arts vendors, food vendors, and a beer and wine garden. The location, intimate venues, and quality performers make the Moab Folk Festival a premier cultural event. Volunteers are asked to perform a minimum of two 4-hour shifts in exchange for admission to the Ball Field and the GCHS evening venue. In addition, volunteers are given a t-shirt and a hearty “thank you” at our post-show volunteer party. Jobs include: Set Up (can include lifting), Clean Up (can include lifting), Ticket Taking, Gate Keeper, Ticket Sales, Retail Sales. Please submit your contact information (email, phone number etc), your availability, and your interests at www.moabfolkfestival.com/volunteer. We will add your information to our list and contact you when we begin to schedule.